This is not a new from of traction but one that seems to have been neglected in the search for cures for spinal pain. Traditional conventional traction has been shown not to work but gravity traction has enjoyed little such scientific investigation despite being around for more than 30 years. 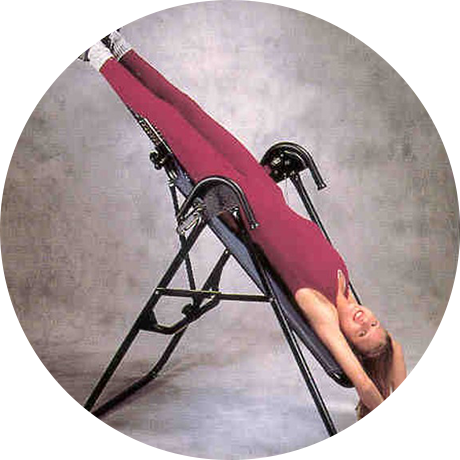 We teach people how to hang upside down on one of our machines here and then they can take it away to use at home for a 2-4 weeks. Gradual reversion of the effects of gravity on the spine may allow the fluid and nutrition that the discso badly needs to be re imbibed rapidly, reducing soft bulges of nuclear material from the centre of the disc.We have a similar device for the neck called Dr DISC which works by a hydraulic pump inflating a rigid collar elevating the head and stretching the cervical spine relieving nerve pressure.